Are you getting a certain vibe from the covers of the books I'm reading lately? Yeah, me too. Though it's purely by chance, I think it's worth noting that after I read the books themselves, I often feel their covers are somewhat of a mismatch. Not that I don't like them. 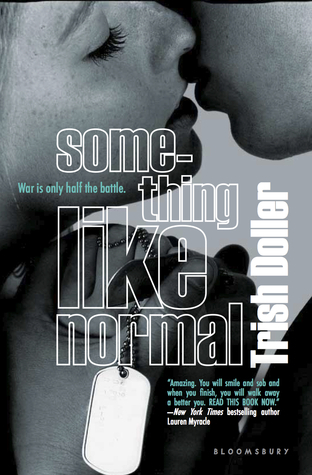 In fact, I quite like the cover for Something Like Normal. It's part of what made me investigate the book further. But I do think they lead you to believe there's going to be more . . . shenanigans . . . going on inside than there really are. Make of that what you will. This is Trish Doller's debut novel, and I had to smile when I looked up her GoodReads profile and she had listed her influences as Kirsty Eagar, Cath Crowley, and Melina Marchetta. Point to you, Ms. Doller. Way to reel in us Aussie YA-obsessed fangirls with just a few well-chosen strokes on your keyboard. But the thing that really drove me to read it was that it is part of the growing New Adult genre. Protagonist Travis is just back from Afghanistan when the story begins, and he can therefore in no way, shape, or form be considered an inexperienced teen. Though he is still very much a young adult. It is exactly this time period that I'm so enjoying reading about these days. So I tracked down an ARC with a few well-chosen strokes on my keyboard and settled in. Travis would rather be anywhere but home. Even back in Afghanistan. It's just that facing his dysfunctional family in all its glory and all his old friends from high school just after coming off a tour in the war seems ludicrous at best. It doesn't help that his best friend and fellow soldier Charlie was killed in front him. But home he is. Travis is willing to put on a good face for his mother's sake if nothing else. But being constantly faced with his mother's anxiety, his father's disapproval, his ex-girlfriend's defection to his brother's arms, and . . . oh, a nice healthy dose of PTSD, it's well nigh impossible to get through the day, let alone figure out what he's going to do with the rest of his life. Then a chance encounter with a girl he used to know introduces something approximating normal into his life again. The problem is Travis wasn't all that nice to Harper way back when. He realizes that. What he doesn't realize is just how profoundly his lack of care impacted her life. And what kind of a grudge she's been carrying around ever since. Not to worry, though. Her fist to his face quickly puts these things into perspective for our young vet. As for Harper, running into Travis after all this time is like a slap in the face. All those feelings and doubts she thought she'd done away with come rushing back to haunt her. Even though he's clearly done some growing up in the intervening years, she's just not sure it's enough to warrant putting her heart in his uncertain hands. My absolute favorite thing about this book is that it's written from a male point of view. I thought Travis himself was impressively drawn, and his reactions felt consistently genuine, even if they occasionally bothered me. And they did. I really liked him, but he drove me batty from time to time with a few of his less-than-stellar choices in regards to his personal life, or, more accurately, his avoidance of said choices. Otherwise, I felt for him deeply. His struggles with his family and his complicated relationship with his mother were the high points of the novel. I like that the focus remained on that and on his experiences in the war, that these key issues took precedence over other secondary matters. As a result, I felt firmly centered in Travis' head by the time a few of the usual suspects rolled around. So much so that when faced with the sheer awesomeness that is Harper, I felt myself reaching out along with Travis. Like she was a drink of cool water in the desert. The relationship development is pretty restrained, which is just as it should be given the fact that Harper is one smart cookie and Travis is all sorts of damaged. When we meet him, he's pretty evenly straddling the emotional maturity line between hormonal teenager and sadder-but-wiser young man. Together they fumble their way toward a sort of middle ground. After the aforementioned avoidance tactics. I loved the arc of Travis' story, his flashbacks to Afghanistan, his tenuous overtures to his mother and to Harper, and especially his interaction with his fellow Marines. Both the ones who made it home and the one who didn't. The ending left me with mixed feelings. While I definitely would not have changed a thing about the place Ms. Doller left her characters in, I (cue refrain) felt that what had been a thoughtful and controlled narrative simply . . . ended. The impact was lessened a bit for me, and I would have welcomed another 40 or 50 more pages. It could be argued that I simply have issues letting go. I merely felt that the sheer distance Travis had traveled merited an extended close. Because I enjoyed my time with him. I harbor hopes for him. And for Harper. Something Like Normal went down smooth in a single night and is due out June 19th. HA! I literally just downloaded this one from Netgalley after hearing about it from Chachic. So glad to hear it's a winner, I can't wait to dive in. Michelle, sweet! Think you'll like it. Travis' POV definitely feels fresh. Yes to New Adult novels! I'm so glad you decided to give this one a try, Angie. It's one of my most anticipated titles this year and it makes me happy that you enjoyed reading it even if you had some issues with the ending (I totally understand though - I would have loved to see more of Travis and Harper). Chachic, I'm really excited to see where the genre goes. More, please! I liked this too. :) I have a review all written but I got my ARC through Netgalley and they specifically said in the acceptance for the review request not to post the review until a month before the on sale date. Poop! Anyway, I understand your refrain - I think my one qualm was there was a lot within a short period of time, would have loved more too. Janice, yeah, look at me with my flagrant disregard for rules and regulations. Hope they don't ask for my blogger card. I normally try to follow those requests, but if they're making ARCs available four months in advance, it's a bit nuts to require reviewers to wait that long to post their reviews. I lasted two months. Oh I thought you got your ARC some other way so didn't have that rule. Gasp, you rebel! I was THISclose to posting mine a few weeks ago because I'd forgotten, but saw a comment somewhere about the restriction and I was like: "!*@&*! )", and held back. Eh, if I do post ahead I'll point at you as my role model. Til a month before the pub date you say? Poop indeed. I don't know if I can wait that long. I completely agree, Angie. I needed a few more pages to be completely satisfied too. HA! I am so getting in trouble now. YES. I love this. And I wouldn't have turned down an additional 50 or 100 pages, to be honest. I loved Travis and I loved Harper. Their time together was so meaningful and beautiful. Jen, nice to hear it's not just me. I think I do have letting go issues. These short single-night reads always leave me wanting more. I haven't read this but I enjoyed the review. I agree about the covers. I've started looking for author guest posts that talk about the making of the covers, where ideas came from, if the author had input, etc. It's always fascinating to get the author's take on their cover creation, isn't it? It's quite the process, and so many people are involved. I'm always intrigued by the end results. I very much enjoyed reading your review, Angie :) It made me scroll back to the top and visit Trish Doller's GR page and then I added 'Something Like Normal' to my wishlist there. I see that the friends I have there have all given it a 4 star or higher rating, I think yours was the lowest(nothing negative about that) rating with a 3 star. I relly like the fact that this story is written from a male point of view, I think I can count on one hand the stories I've read from a male view. Mari, I'm so glad. I think the response to this one is going to be overwhelmingly good, which makes me happy. And I agree about the male POV. It was extremely refreshing. SOMETHING LIKE NORMAL is one of the best contemporary books I've ever read. Realistic characters, witty dialogue, and heart for miles. Mixed with Doller's beautiful writing style, this book is a don't miss!! You'll fall in love with Travis and Harper, and root for a flawed character who's just trying to find his new normal after returning from war.